Thermage and non-invasive skin tightening are nearly synonymous. Unlike competitor’s devices, the ThermaCool NXT from Solta Medical operates on radiofrequency, rather than laser light. Radiofrequency treatments are safe for all skin types. ThermaCool NXT relies upon mono-polar, capacitively coupled radiofrequency. The physician controls radiofrequency to tighten existing collagen and stimulate the production of fresh collagen. Treatment results are immediately apparent and a single therapy session may continue to effect positive change for up to six months. Patients suffer little to no downtime, few side effects, if any, and often require only one treatment session lasting 20 minutes to two hours. Solutions offered by competitors do not treat the dermis and deep subcutaneous tissue to which the Thermage system heat energy can reach. Competitive devices also lack the integrated patented cooling technology the ThermaCool NXT precisely coordinates with the radiofrequency treatment. The unique combination of heat energy and cool cryogen has made the ThermaCool NXT a staple among dermatological practitioners worldwide. 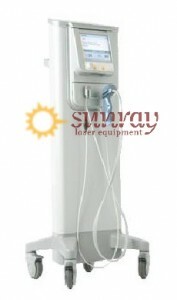 SunrayLaser.com is always proud to carry equipment from the Solta Medical portfolio of medical devices. The pioneering Thermage brand has maintained high standards of excellence since its inception. Expert technicians refurbish each Thermage ThermaCool NXT offered for sale. Your unit will operate safely and conform to the manufacturer’s original equipment specifications. Our loyal return customer base attests our ability to deliver exceptional value by carefully reconditioning only the highest quality aesthetic medical devices. Practices much like yours throughout the world have discovered that a ThermaCool NXT can draw in new patients. To find out how SunrayLaser can help your office grow, please take a moment to tell us how to reach you. Simply fill in the form below. A knowledgeable consultant will contact you quickly.